Criterion has announced a November 15 release date for Akira Kurosawa’s Dreams, marking the first time the film has received the much celebrated Criterion treatment. Criterion’s Dreams will be available on both Blu-ray and DVD, and it is sourced from a newly restored 4K transfer that was supervised by the film’s cinematographer Shōji Ueda. The release will be region encoded for the North American market. Extras include a new audio commentary by Kurosawa expert Stephen Prince, a 150-minute making of documentary shot on the set by Nobuhiko Obayashi, as well as the 50-minute interview documentary Kurosawa’s Way that was released in 2011 in France after being put together by Kurosawa’s longtime translator Catherine Cadou and featuring numerous major filmmakers talking about Kurosawa and how he influenced their own work. The extras also include separate interviews with director Takashi Koizumi, who worked as Kurosawa’s assistant director for the film, as well as Teruyo Nogami, Kurosawa’s longtime assistant and production manager. The release also comes with a new English subtitle translation, a trailer, and a booklet with an essay and the script for the never-filmed ninth dream. Criterion’s plans to release Dreams were rumoured at the beginning of the year, and it is now great to see those rumours confirmed. The new transfer is especially welcome considering the fairly poor quality of the available English language releases. The selection of supplementary materials is also very interesting indeed. 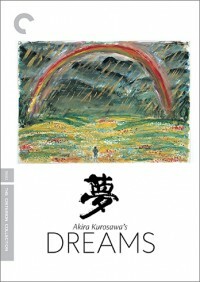 Akira Kurosawa’s Dreams can currently be pre-ordered from Criterion’s webshop.